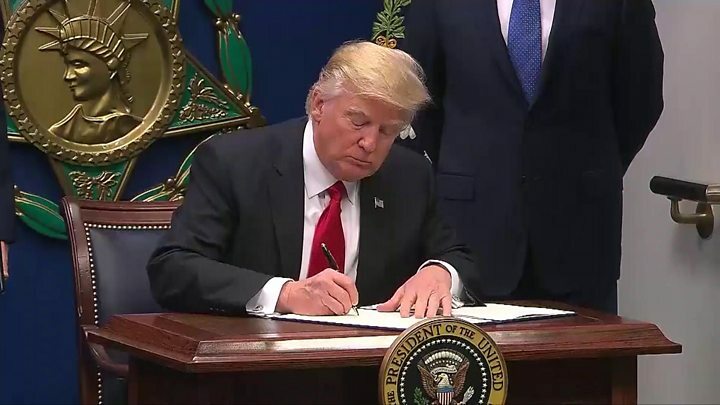 US President Donald Trump has taken a swipe at "so political" courts, as his immigration travel ban faces a major legal test. Mr Trump told a gathering of police chiefs in Washington DC that he has the right to enact his executive order. His remarks came a day after an appeals court heard a challenge to the Republican president's policy. It temporarily suspends the US refugee programme and bans travel for citizens of seven Muslim-majority countries. Democrats and other critics have said Mr Trump's comments about the judiciary undermine a core principle of US democracy that courts are supposed to be independent. The judiciary is a co-equal branch of the US government, along with Congress and the president's executive branch, under the Constitution. 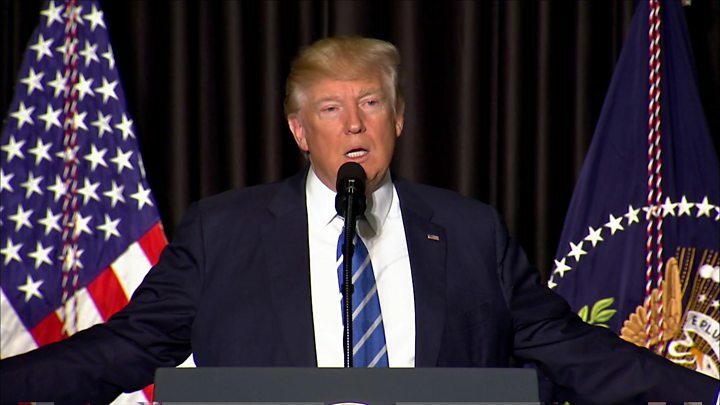 Addressing police chiefs on Wednesday morning, Mr Trump said he would not "ever want to call a court biased". He added: "Courts seem to be so political and it would be so great for our justice system if they would be able to read a statement and do what's right. And that has to do with the security of our country, which is so important." During his remarks, the president also said a Boston federal judge who had ruled in favour of his policy was a "highly respected" and "perfect" jurist. His criticism of the judges has sparked condemnation, even from within his own party. Senate Majority Leader Mitch McConnell warned "it is best not to single out judges" when asked on Sunday. Also on Wednesday morning, Mr Trump criticised retailer Nordstrom after it decided not to stock the new clothing line of his daughter, Ivanka Trump. "My daughter Ivanka has been treated so unfairly by @Nordstrom," Mr Trump tweeted. "She is a great person - always pushing me to do the right thing! Terrible!" Shares of the retailer fell 0.7%, before rallying. In Tuesday's hearing, the San Francisco-based 9th US Circuit Court of Appeals posed tough questions at those challenging and defending Mr Trump's travel ban. The court is expected to issue a ruling this week. But the case will probably end up at the Supreme Court, the nation's top judicial body. The court must decide whether Mr Trump acted within his authority or violated the US Constitution's prohibition on laws favouring one religion over another, as well as anti-discrimination laws. The 9th Circuit is expected to rule on whether a lower court judge in Seattle - whom Mr Trump described as a "so-called judge" - acted properly last Friday in temporarily halting enforcement of the president's order. Mr Trump's 27 January order seeks to bar travellers from Iran, Iraq, Libya, Somalia, Sudan, Syria and Yemen from entering the US for 90 days. It would also ban all refugees for 120 days and indefinitely exclude those from Syria.